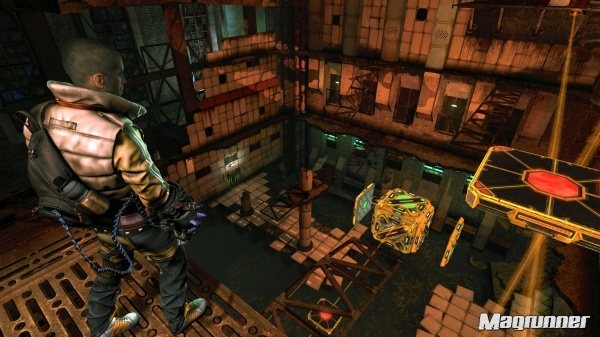 Magrunner is a first-person action/puzzle game developed by Frogwares and published by Fox Home Interactive. The game was originally released for PC last June and just now made its way to PS3 and Xbox 360 for the asking price of $9.99. If you're familiar with Portal, you'll likely feel right at home with Magrunner once you get adjusted to its gameplay since it's very much inspired by Portal. Magrunner uses magnetism for all of its puzzle solving. You start out with a magtech glove that can fire out a red and green laser. The lasers can be used to shoot blocks and change their color in order to change their magnetism. The general rule of the game is that the same colors attract each other while opposite colors repel. Each object has a certain range of a magnetic field that can be seen by pressing the triangle button. Puzzles start out rather simple and then slowly climb in difficulty. Simple puzzles involve situations such as standing on blocks and then switching their magnetism so that they both repel and then send your character flying across to a out-of-reach platform, while more advanced puzzles will have you doing stuff such as setting up several objects with magnetism in order to work through several magnetic fields that will either repel or attract the block or platform that your character stands on. The overall pacing of the game is just as good as Portal was. The puzzles eventually get to where they become mind-boggling. Along with the laser shots, you'll later gain the ability to fire out a construct of a dog (Newton) that can help you repel or attract nearby objects. The story of the game starts out rather simple with Dax being one of the few chosen Magrunners at a Magetch facility and he must work his way through several training room. As the levels progress, things start to go wrong and Dax gets to travel outside the rooms. It gives you that sense of suspense like when you first exited a training room in Portal. The game is basically an interpretation of H.P. Lovecraft's Cthulhu Mythos from his "The Call of Cthulhu" short story. Basically, if you're into a puzzle game with alien cult plots, you'll find something to enjoy in Magrunner's overall story. The game has a few characters besides Dax that will contact him through a hologram on his magtech glove every now and then. The voices in the game are decent, nothing mindblowing, but the voice actors played their parts well. The game looks and runs pretty smooth overall. There are some slight framerate hiccups at times, but the game was overall fluid. The surroundings have some good atmosphere in the later levels. I actually felt a sense of worry at times with some of the room designs and I had a few claustrophobic feels in some areas. The overall puzzle rooms can really get overwhelming at some points in terms of what to do. I often found myself completely stumped then would go online and find an online video to help out and the solution was rather simple. The gameplay is overall simple, but it's so easy to forget about some things while progressing. With Portal I never did need anything but a slight hint for one puzzle. This was both good and bad, but overall, the experience with Magrunner was quite pleasing enough to keep me glued to the game for several hours a few days in a row. At $9.99 on PSN and Xbox Live, Magrunner: Dark Pulse is a steal. It's a very solid action/puzzle game that will last you for quite a while with its 40 levels. The story was there just enough to keep me entertained throughout each room and I never did get the feeling of repetition with the game once the story got going. If you liked Portal, you'll feel right at home with Magrunner. Final Rating: 85%. 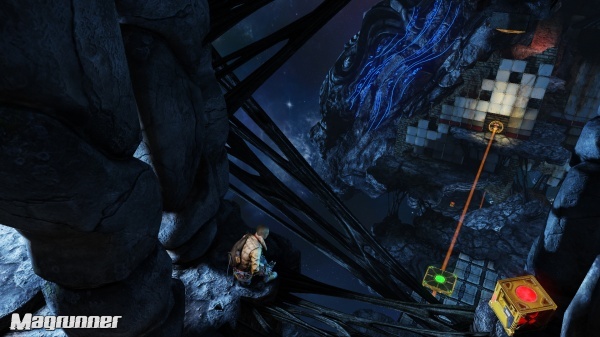 If you're looking for another game like Portal, then Magrunner is definitely worth a try.